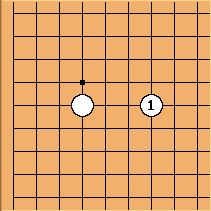 White's two stones are two spaces apart. The shape is more easily cut than a one space jump. It emphasizes rapid development over instant stability. On the side it is called an extension. In particular on the third line, it is impossible to cut the two space extension without support. This makes the two space extension on the third line a very efficient configuration, making a nice balance between development and stability. Here you see Black cannot cut without support. 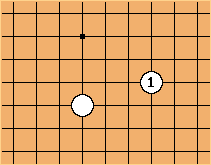 When the move is made towards the centre it is labeled a two space jump. Now there is no support from the side for connection. Here you can see ho Black can cut, which he still will be more likely to do with support than without. 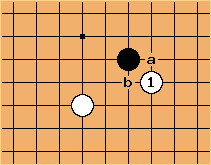 White catches a stone in a ladder, while Black grabs the original white stone. This is why a two space jump is often used in hostile spheres of influence to sacrifice a stone. The large knight's move is even weaker and more easily cut than the two space extension. As it is biased to a certain direction, it is taking development into account more than the two space extension. 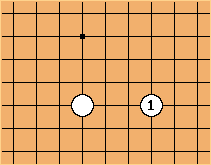 The basic technique of cutting a large knight's move in isolation is by attaching to one of the stones. Next there is a cross-cut with support (see later). This is the bad way of cutting: a and b are now equivalent for connecting with a ladder capture. On the side the large knight's move very often goes from the third to the fourth line, keeping balance between development and stabiity. Cutting on the side with the mentioned technique is not possible. 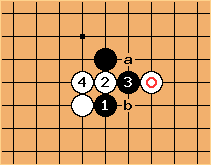 However, it is possible to take away the eyespace of the white group, by playing to . 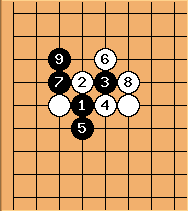 After , White can play a double hane at a or stretch at b. Depending on the surrounding stones, can become a succesful invasion. 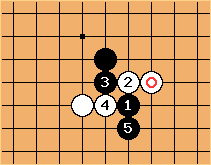 This move, when the black stone is on 3-4 is known to invite the taisha joseki. In general, there is one best way to cut the large knight apart. 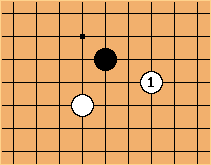 After Black will choose where to connect and White will likely cut the other side, but his marked stone can be caught in a ladder. 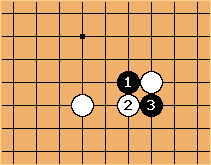 In the corner, the sides play an important tactical role, so there White's move is possible. In general this large knight move is aggressive and assumes a certain superiority in this area of the board (such as ladder breakers). If White hanes at the outside, is a very painful move, splitting White's hazama tobi of and in a natural way. 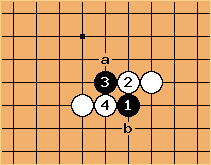 The keima at also cuts and results in a windmill formation. Given the fact that White will usually play the large knight in his favourable environment, creating such turmoil is likely bad for Black. Now is more of a shoulder hit. 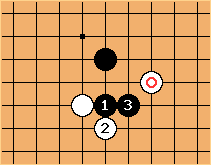 As always against the diagonal check, Black can answer a (peaceful) or b (cut).